The Dot Bowls are so popular they occasionally appear on Food Network shows. Initially only three colors were released in the Dot Bowl series, but due to their popularity a fourth color was added a year later. “Pyrex Ware. Puts the fun in functional,” proclaimed a 1969 catalog. 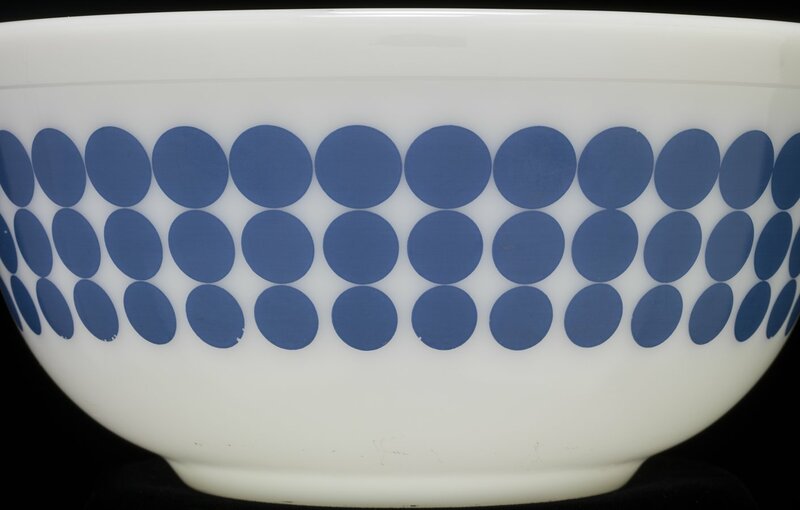 The Dot Bowls are one of the most popular Pyrex patterns. Released in 1968, the first three Dot Bowls came in orange, yellow, and blue. Each bowl was sold separately rather than in a set. By 1969 the Dot Bowls were listed under the “Best Sellers” heading in the Pyrex Ware catalog released by Corning. Although there are four colors in the Dot Bowl series, only the red, yellow and blue bowls were initially released. The larger Green Dot bowl was added in 1969. The Orange Dot Bowl came in the 1 ½ pint round bowl (401) and retailed for $.87. The Yellow Dot Bowl came in the 1 ½ quart round bowl (402) and retailed for $.97. The Blue Dot Bowl came in the 2 ½ quart round bowl (403) and retailed for $1.37. The Green Dot Bowl came in the 4 quart round bowl (404) and retailed for $1.77. Despite the popularity of the Dot Bowls, they were discontinued in 1973. Dot patterned Pyrex dishes have appeared on Food Network shows such as “30 Minute Meals” with Rachel Ray and “Good Eats” with Alton Brown.